All there is to say is Wow! I received my new Tenkara Bum 36 rod this week and if you are looking for one rod to fish kebari, bead head nymphs or overhand worms with split shot, this is the rod. After fishing with Chris on a few occasions and watching him test lots of rods, I knew he would build a great rod and he has. 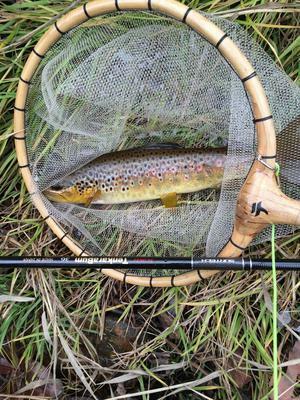 I took it to a PA stream today and on the third cast landed a small brown trout with a kebari fly. After a few more fish with tenkara type flies, I decided to test the rod with Chris' one fly pattern, the overhand pink chenille worm and a split shot, and connected with much larger fish, some a little over 15 inches. The rod cast a variety of flies well and handled a range of fish. The overhand worm is amazing - simple to tie, easy to fish and extremely effective. One fly, one rod may be the new mantra for my tenkara/keiryu fishing. Great job on the new rod. I'm eager to put my hands on one. one simply can't go wrong. It's a winner for sure! You have to know that after years of experience, thousands of casts, testing rod after rod, flys, baits, lines etc. Chris would naturaly come up with one of the BEST rods out there, in the world! Thanks 10bum!!! I received mine this afternoon. I didn't see any point in waiting for reviews. Feels good out of the box. Gonna try it out tomorrow. I shuddered when I saw what usps did to the shipping box. Thankfully the rod was undamaged. This rod will no doubt become a classic. I own too many 360 size rods already but I just had to get one of these - so glad I did! I knew it would be a great product - I echo what all of you others have said. This is the nicest foam handle I have ever owned on any kind of rod - it has the same density and rigidity as cork but is even more non-slip and shaped just perfect. I like the fact that you can finger-tighten the handle end cap securely against the foam without a gasket or O-ring, and I also can tell that the rod sections are reinforced at the junctions. Great action and balance, excellent quality, none of which surprises me with Chris and Suntech coming together on this one. I think this will also be a great rod for a beginner, all-around or a youngster that is ready for their first full-sized rod. Great job, definitely a classic! This rod is a delight to hold and cast. I hooked a small (14") carp this afternoon. He spit the hook before I could land him but the TB36 handled the fight admirably. I cast weighted nymphs, overhand knot worms and CDC/Elk dries with little effort. I'm hooked. My hat's off to Chris and Suntech!